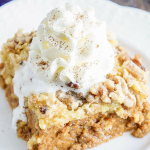 This Old Fashioned Apple Cake is made with warm spices, oatmeal, and apple jelly for a simple and delicious fall dessert! 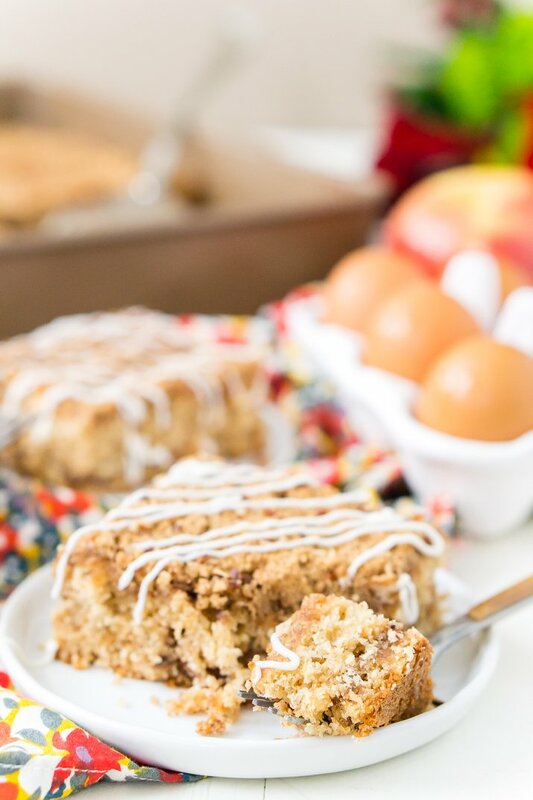 This Apple Cake is the perfect way to welcome fall and a family favorite you’ll want to make again and again! Alright, alright, alright, I’ll admit that I’ve been ignoring the fact that fall is on its way just a bit. It’s been truly amazing being self-employed this summer. When I was working in an office, I hardly ever go to enjoy the warmer months because I was working during the week and on the weekends on the blog, but this year I actually got to take some time off! September is my favorite month, we always kick things off with my husband’s birthday on the 2nd (check out his cake) and our anniversary is on the 17th, so there’s always lots to look forward to. Plus, it’s absolutely gorgeous here in Maine this time of year. But I realized this weekend that summer really is coming to its end. I have one more day at home before jetting off to Hawaii for a week and by the time I get back, there will officially be just one week left of it. But I can assure you, fall will have already settled in. 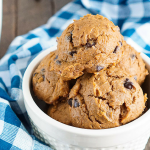 And with fall comes football, and colorful leaves, and of course, cozy baked goods! 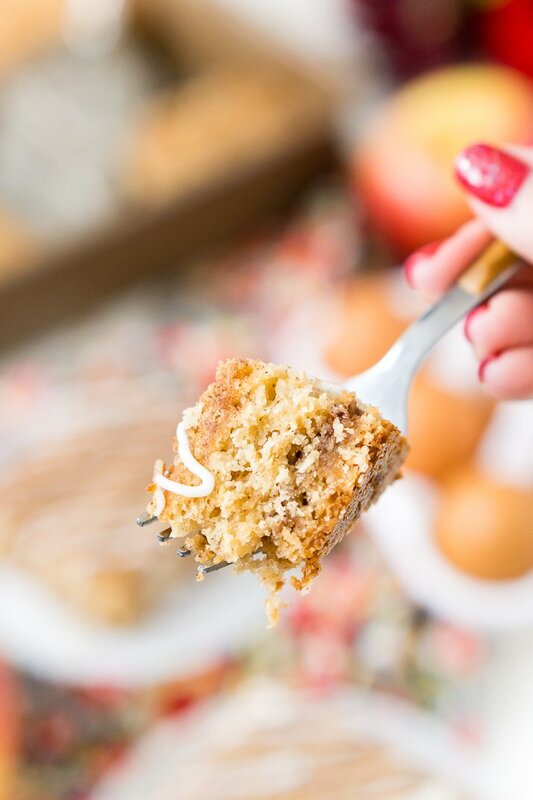 This Old Fashioned Apple Cake might be as comforting as it gets. I’m pretty sure I could get my mother-in-law to do anything for me if I offered to make her this cake, haha, just kidding, she’d probably do anything for me anyway because she’s awesome, but she really did love this cake! 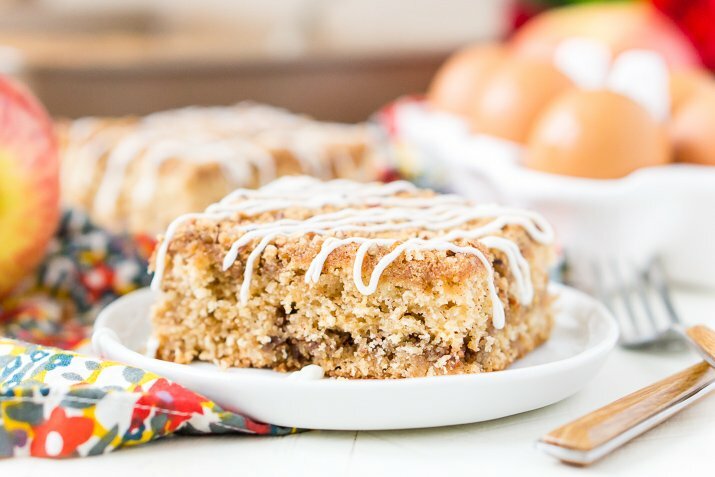 Unlike most, this apple cake actually doesn’t even have apples in it. 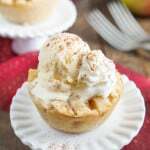 Instead, it’s made with apple jelly which gives it loads of flavor throughout and keeps it moist with the help of some sour cream. I also really love the oatmeal that’s worked into the batter which gives a real old-fashioned feel and flavor. 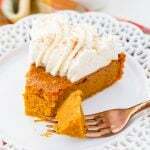 And once that crumble mixture is layered in the middle and baked into the top and the whole cake is drizzled with icing, it becomes a dessert people can’t get their hands off! 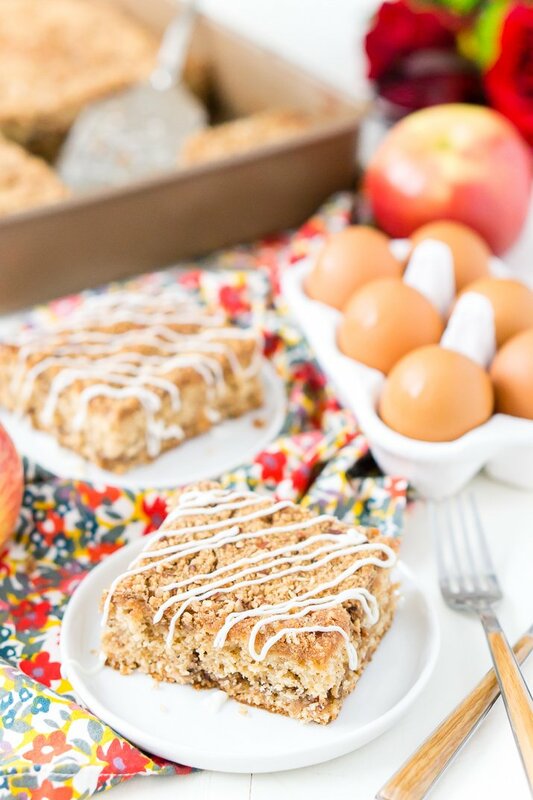 Pin this Apple Cake For Later! 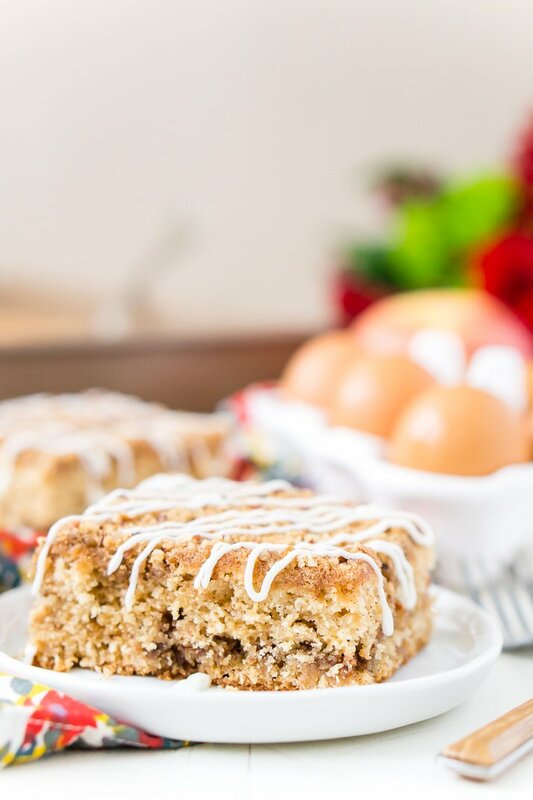 This Old Fashioned Apple Cake is made with warm spices and apple jelly for a simple and delicious fall dessert! Preheat Oven to 350 degrees F. Grease a 9x13-inch pan and set aside. Mix together the topping ingredients in a medium bowl and set aside. Sift the flour, baking powder, baking soda, apple pie spice, and salt together into a medium bowl. Cream the butter and sugar together in a large bowl or stand mixer fitted with a whisk attachment until light and fluffy. Add the eggs one at a time, beating well between additions. 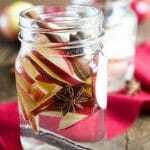 Mix in the apple jelly, vanilla, and the minute oatmeal and beat until combined. Add in the dry ingredients, alternating with the sour cream and mixing well between each addition. Pour half of the batter into the prepared 9x13-inch pan, then layer with half of the topping mixture. Cover with the remaining batter and sprinkle the top with the remaining topping mixture. Bake for 40 to 50 minutes until toothpick comes clean from center. 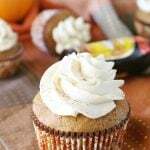 Mix the icing ingredients together, adding extra heavy cream or confectioners' sugar to reach desired consistency and drizzle over cake. This looks SO good! 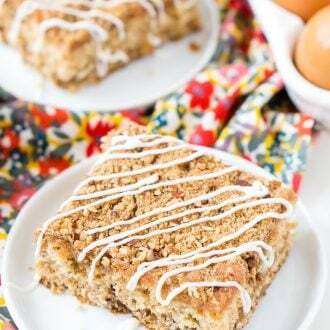 That cinnamony topping and the creamy glaze look just perfect. I neeeed this! Thank so much, Becca! I sure do love the topping on this cake! This looks delicious! I’ll go ahead and make a batch for breakfast, lunch and dinner – thanks! Right! 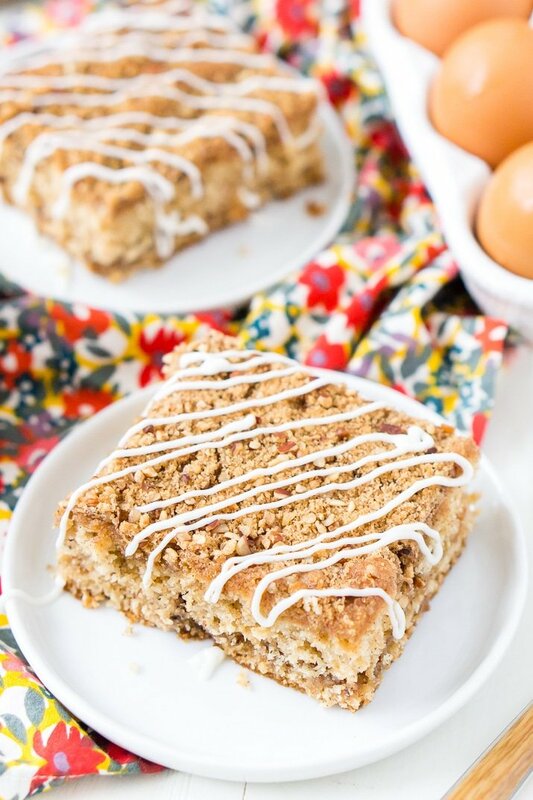 Oatmeal totally makes this acceptable for breakfast! Yum! 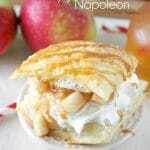 LOVE all things apple especially warm spiced desserts for fall!! Looks great! I have never heard of using apple jelly in an apple cake, Great idea!! Thanks, Beth! 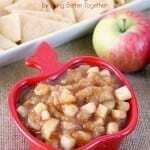 I really loved trying apple jelly instead of apple butter! Apple cake, er, apple anything is my absolute fave. This looks incredible! I can’t wait to try it!